Tonight TwoPints and I watched the final two episodes of Celebrity Apprentice off the TiVo. Two episodes... Five hours! I guess Trump fired the editor during this season too. It was five hours of "celebrity" snobbery and some fairly compelling drama... well except I already know who wins. I knew the morning after the episode aired. E! Online and People.com spilled the proverbial beans on their website mere hours after the winner was decided. This is not a gripe against media printing spoilers in the DVR age. I've heard those complaints, and I don't think they hold much water. My gripe is a practical one. Why do "news" organizations write titles with enough information in them where you don't have to read the actual article? Instead of "Trump picks Joan Rivers as the next Celebrity Apprentice" (sorry, now you know too), how about "Trump picks the next Celebrity Apprentice." What is the difference? In the RSS age it is the difference between me visiting your site or not. I can't remember the last time I visited E! Online... I just read their RSS feed titles on my iGoogle page and I'm good. I'm pretty sure that isn't what their advertisers want to hear. Notice how I didn't put "Victory Golden Monkey: Awesome... go out and buy a 750mL bottle right now!" as my post title. Just saying. A magical, mystical Monkey whose golden soul glows with the wisdom of ages. This radiant, flavored ale is rich in the spirited tradition of Belgian-inspired brewing. Our Golden Monkey is both playfully delightful and profoundly satisfying. Exotic spices from the East round out this global journey to joy. Get on board. This Monkey's bound for glory! I have visited Victory Brewing Company in Downington, PA many times while I was working on a project for West Chester University. It's a full scale brewery, restaurant, and bar (and you can purchase take home beer... sweet!). It is not really a comfortable friendly bar where everyone knows your name, but they make fantastic beers, so the get a free pass on the snobbery... It could be a Texan bias. Let me start by saying Golden Monkey is on my short list of favorite beers. The 750mL version is bottle conditioned, making it suitable for cellaring. This one, picked up from the brewery, lasted three years in my kegerator, which is probably a personal record for a Monkey. The beer pours with a thin white foamy head that disseappers within a minute. Typical of many Belgian style beers, the carbonation is lively. The nose was very nice... "Belgian-y" for those who just like beer... coriander, herb, and slightly fruity for beer snobs. For a 9.5% ABV, this beer is amazingly drinkable, particularly when cold. An hour elapsed between first sip and last (a function of enjoying the beer and having to put the kids to bed). As expected, the beer is much better (more complex) warm. I typically enjoy craft beers a little colder than the suggested temperature, but in this case preferred the flavors after 45 minutes to the earlier ones. Age seems to have mellowed some of the powerful Belgian Tripel flavors, however, age probably has added to the overall complexity of the beer. I would also like to add this version seemed very different from the 12oz bottle version. I wish I had one in the fridge tonight, but if memory serves me right, it is sweeter and has less depth... both most likely attributed to the difference in aging. Being that this three year old Monkey was on my virtual display shelf in the kegerator, my expectations were high. Maybe too high. I loved the beer, but I remember the four year old Monkey I opened several years ago being one of the best cellared beers I've ever opened. This one didn't live up to that memory. Ooh ooh aah aah! It's Monkey time! Golden is the perfect adjective for the color of this beer. After three years it still has wonderful carbonation. The taste is crisp. To me this screams "Belgium!" and also "Drink Me!" (okay so I've been watching Alice in Wonderland with my little Half Pint... but I digress). Golden Monkey is probably THE one American Belgian style beer that has turned me into the happy Belgio-American beer drinking person I am. After letting the beer rest and warm up a bit, all the complicated flavors that make up a Belgian style beer begin to come out. While taking several sips, what strikes me is that your palate is left with very little after taste. In other words if you don't grab the tastes while the brew is in your mouth you might miss them. It is not just the spices that grab you with this beer, it's more of the very tasty yeast and malty flavors. The Belgian Tripel sweetness comes out as the beer warms up. Very delicious and worth the extra $$. 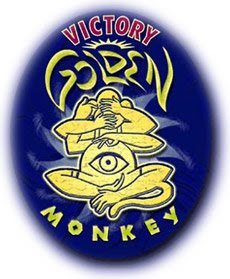 Two pints up to Victory for its superb Golden Monkey. People.com: SPOILER ALERT: Find Out Who Was Crowned Dancing ChampE! Online: Shawn Vaults Past Gilles on Dancing With the StarsNice one E! Hmmm, I think my life is better without RSS feeds. But better if I were to get my hands on one of these monkey beers.